Doing campaign levels in Kingdoms of Middle Earth is fun and good for a number of things, such as: Leveling up your heroes, farming items and hourglasses, getting armor scraps to trade for equipment, or get awesome equipment/items/ tokens from Smaug. But there is also the Campaign High Score Event, either individual or alliance based. Most of the times, people will run down the campaign levels with full t1 armies and wipe out any resistance. But this strategy gets you far from a high score on the different levels, which you need if you wanna compete in the aforementioned events. So what army should you use? T1 or T5? Mixed or single troop type? Should you use speed ups? How is campaign high score even calculated? In this article, I give you a rundown of some very basic tips to get your high scores up and be competitive. You can access your current stats by pressing on a campaign level on a map, and then press the “i” button next to your current high score. In the pop-up screen, you can see the above mentioned stats labeled as ”efficiency”,”vitality” and ”time”. It shows the stats from your latest attack, and from your record high score attack. The key in getting high scores for the efficiency and vitality points is using as a low a number of units impossible, evidently. BUT, there is a major BUT…There is of course an absolute minimum number of troops you need to defeat the goblins on a certain map. The big BUT here is that that minimum number of troops does NOT yield you the highest high score for that map! That is because of the battle mechanics in this game. I will do a post later on the exact mechanics as far as I understand them, but suffice to say here is that the game battle mechanics work in rounds. Each round of battle, damage of all standing troops on both sides is calculated and then distributed among the enemies. Lets do a quick and simple example. We will not focus on factors such as runes/heroes etcetera. You attack with an overwhelming number of troops: 1000 t1, with 1000 attack points and 2000 health points. The goblins are wiped out completely in the first round, and they kill 50 of your troops. Now you attack with 100 t1 troops. Round one kills 50 troops on both sides. Round two, with 50 troops remaining on both sides, kills 25 on both sides, and so on. In the second case, if you win through RNG, you have used the minimum number of troops, but battle was spread out over multiple rounds, and you lost almost all troops. Turns out that this significantly lowers your high score. Somewhere in between these extremes lays the perfect number which will net you the highest score. I will be honest again and tell you that I do not know the exact number necessary, nor can I because this is complicated by factors such as Goblin hero level, your hero level, research, runes and equipment. It will be a bit of trial and error, but for now, remember that minimum =/= best. Ok, I should not have to mention this, but always use your highest level hero, and make sure he has your highest gear equipped, preferably the Pilfered set from Smaug of course. To further increase your score, always try to use runes. Normal combat and defense runes are obligatory, and if you have enough Runes of Fury and/or Runes of Invulnerability, use them. Both attack and defense runes will help lower the troops necessary and up your scores. Please also not that the normal and super runes stack! So a combat rune and RoF give you 120% increased attack. If you don’t have runes laying around, don’t worry, you can still get great scores without them with the right troop numbers, albeit not the top scores. What troops should you use? How many troops should you use? 1. What troops should you use? First and foremost, you should use your highest Tier troops to get the greatest scores. You will need less troops and less will die, increasing efficiency and vitality scores. 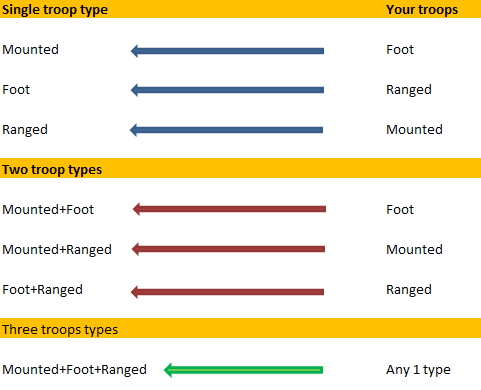 But what troop types should you use? When you attack with Mounted troops, the enemy foot troops have an advantage over you. When you attack with ranged troops, you have an advantage over the foot troops, but this time the mounted enemy has an advantage over you. 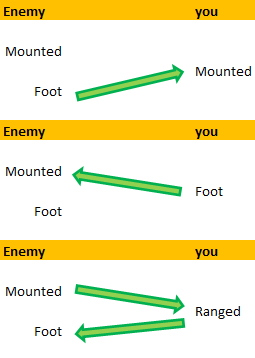 If you attack with foot troops however, only you have an advantage, over the mounted enemy. So as a general rule of thumb, use the enemy troop type that is strong against the other enemy troop type! The second note is that, when I talk about the enemy having all 3 troop types, I mean the enemy has reasonable even amounts of all troops. But some maps have for example 500-600 mounted and foot troops, and only 60 ranged troops. In this case, it is better to treat the enemy as having only mounted and foot troops, as the number of ranged troops is so insignificant compared to the other types. In such case, choose your troops according to the above picture. 2. How many troops should you use? I have already mentioned how I cannot give exact numbers for troop numbers needed for the best scores, due to multiple factors. So basically, its gonna be trial and error finding out what troop numbers work for your specific setup. But there is something you can do. If you go to my campaign article, you can download the campaign spreadsheet which lists the enemies for most maps. You can fill in your hero level and research etc, and it gives you the number of t1-3 required to beat the map in one single round. 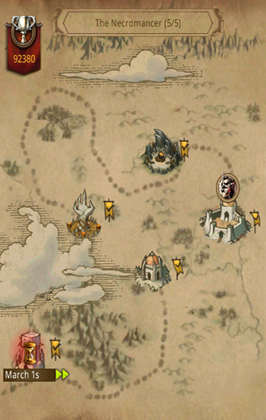 Take one single map with a medium amount of enemies. Attack it with the suggested amount of t1 troops, and look at your high score. Now attack again with 25% more and 25% less t1 troops, and see again what it does to your score. Shouldn’t take long to figure out approximately the right amount of troops this way. Once you have the right number, translate the t1 troops needed into tier 2-5. Attack with that and you should get your highest score. If you do this for medium sized enemies on a few maps, you can start to see roughly the amount of troops needed to defeat a certain number of enemies. Then use this knowledge to go after the other maps. 3. Should you use speed-ups? Update: Marching times have since been removed form campaign, so you cannot even use hourglasses anymore. Following the above steps, you should arrive at your best efficiency and vitality scores, but what about the time score? Well, although march times across maps and levels vary, I have never marched for longer than 30 seconds on any level. This could be because of tavern, I don’t know. But basically the only thing you can do to decrease march time more is apply a Bilbo’s hourglass as fast as possible. But should you? Well, it turns out the time factor is not as influential as the other two. Assuming you go with high tier, high hero armies at it, applying an hourglass only increases high score a little bit. For scores around 200.000 without speed up, an hourglasses only adds a few thousand points max, from personal experience. The bonus is usually lower than 1%. So unless you want to be the absolute number one and have a RoI/RoF burning, or you have a shitload of hourglasses laying around, you shouldn’t bother. Especially in alliance based campaign events, it is far more important that EVERY alliance member plays the levels. This entry was posted in Articles, Strategy and tagged Alliance, battle mechanics, campaign, campaign event, equipment, farming, foot, Hero, high score, hourglasses, kabam, kingdoms of middle earth, levels, mounted, ranged, rune, rune of fury, rune of invulnerability, Smaug, Spreadsheet, tier, troops by beardmonkey. Bookmark the permalink. Thanks for the great info BeardMonkey… Any chance of working Giants and Master rangers and all the high end hero gear etc into the chart as well? 1. what do you mean with the “strong against %” in the little calculated for the “actual additive numbers” ? 2. you’re saying that these numbers aren’t for the highest scores but for the minimum troop loss, but you also said in your post that minimum troop loss is parallel on the highest scores, isn’t it? again, thx a lot for this spreadsheet man! how do you use the hourglasses? I’m a high score event does your score only count once or can you pay the campaigns multiple times to rack up points for your alliance? every time you get a high score the difference from your last score is added to your total. if you dont get a high score you get no more points. This means that you DO NOT have to beat your PREVIOUS HIGHSCORE that you got from a previous event or before the current event in general. So go through each and every map during an event because each score matters. Carl’s statement is correct ONLY IF we talk strictly about the scores during the event. im on 97, I am sittin at #2 but I know I can do better, is there an excel calc out there? No, not that I know of. It is notoriously difficult to figure out all formulas. And you need two: 1 to predict battle outcomes, and then one to plug in these numbers and predict high score. 97 here too!!!! What what! Hi Beardmonkey. I’m working on campaign guide for my alliance in E5. I’ve used your excellent spreadsheet and have added experimental numbers for T4 and T5 ‘pilfered’ from the #1 on our server. I noted your nominal multipliers for the number calcs for T1, 2 and as being 1, 2 and 4. Using the experimental numbers I have I think I have the multiplier for T4 and 5. I have also added in shield wall, battle cry, ferocity and resilience into the bonus multiplier. My guys are getting pretty good scores although, as you state, minimum troop number does not equal maximum score. This is my per project now and it would be nice to work on mx score calcs if you are interested. I have a bitly link to my google doc if you want a look. Cheers. I’m Rich1979 on Line and Rich1979 Minas Morgul on Touch (prefer Line). Have you had any luck, or tried to develop a formula for estimating the proper troop amount for high score, rather then guess work on each map? I’ve been working of your base campaign sheet, and have adjusted it for varying troop types to give the actually number of troops, incorporating split troop types, for exact numbers for minimal troop losses. As well, I’m trying to calculate estimated troop loses given such, and loss %age, to see if anything uniform shows up. I’d be happy to share my work so far, though unfortunately I’m working in open office format, not excel. Play on bilbo 82. Could really use your info, thank you. I really would like a guide of how to get higher scores. I can only get in the top 300 on my server. I have found a pretty near perfect set up to campaign, as it pertains to the amount of troops u should use @ each lvl on every map. With my formula I am individually top 10 or better on every single map. I am not # 1 on every map & not exactly sure what the people ahead of me r doing to better my scores. But, this is only on a few maps. Other than that if I’m not ranked # 1 on a map, it’s bc whomever is #1 has the exact same score as me. But overall, I’m the #1 player in the campaigns. You can check out 96 & see for urself. If any1 from another server other than 96 & 112 wld like to know my formula, plz let me know. Send me ur layouts please for all modes I have all chapters open but need that little edge to boost. I think I’m on 108 so I’m not competition for you. I play on 88…i’d love to know ur formula! I’m on 64. Send away! Hey Prophet. I was doing really well but have now been edged out i think it is because some players have greater shield wall. I am on bombur 40. I would really appreciate any help on this. I would also love to know your formula, I’m on 15 so no worries there. Thank you. Love to get a copy. I’m on 81. I have one as well that I have been working on and could really use some new thinking. I would love a good formula to max my scores. I am on world 71. I am top 100 using someone elses spreadsheet that needs a lot of work. Would love to see yours if you could send it to me. I’m on Saruman 64. Imyurhucklberry is my game name. Thanks!! Bilbo62 here. I’m in the top 20 here and would like to compare your numbers with mine please. from world 71, and would love to know your formula if possible! would be greatly appreciated. Would really like to see how you counted it. I’ve tried but dont get good scores. I am in Bilbo 81. I would love to know your methods. I am top 50 in my world on campaign but need to get back to the top 10. My alliances sheet is vague at best but we are a top ally in our world. I would greatly appreciate your help. Dear Prophet I am new to this Game and i play on 59. I need all the help i can get on this server.Please can you send me the tips and spread sheet i would appreciate it Sir. Thank you. Hey Scott, what name do you play under? I’m on 59 also! Hi Prophet, I’d love to know the formula and play on Bifur114 so would not be competition. Thanks! Ya I would love to see your formulas for campaign high scores. Figuring it out myself is worse than self dentistry?? Some of the guys i play with in kom have come up with troop amounts and types for each map in campaign if you like i could share this with you. depends, do you mean the goblin troops and types for each map, or troops needed to secure best score? Im in 57 and 99 but thinking of venturing to 97 to check it out what is your game tag there so i can look you up when i arrive. I have a system as well, I wld like to compare if u wldnt mind…..? Isn’t ent gear the best for campaign ?